Have you been thinking about using BuddyPress? Are you currently using BuddyPress and think you could be doing something better? This month we'll learn from John James Jacoby, Boone Gorges, Tammie Lister, David Bisset, Michael Eisenwasser, and Bowe Frankema. These experts have helped build BuddyPress into what it is today and have written and spoken about it extensively. There is no better place if you want to know the ins and outs of building a site, theme, or plugin with a focus on BuddyPress. This month, we’re doing things a bit differently. This event is actually two separate sessions, but they’re being sold as a single bundle. That means you’ll get to learn from 6 different experts for one extremely low price. 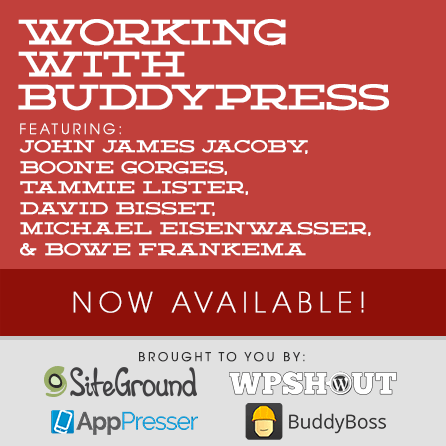 On Saturday, June 21, and then again on Saturday June 28, you can join John James Jacoby, Boone Gorges, Michael Eisenwasser, Tammie Lister, David Bisset, and Bowe Frankema to learn everything there is to know about BuddyPress. Between the two weekends we’ll be cover topics ranging from how any site can build a community by leveraging the powers of BuddyPress (both in conventional and non-conventional ways), and how to extend the capabilities of BuddyPress as a developer. If you’ve been thinking about using BuddyPress even a little bit, this session is for you. Where else will you find and learn from the creators and leading experts of BuddyPress? This live session will take place across two different days, June 21 and June 28th, starting at 1pm EST each day. Member profiles are one of the most powerful and frequently used parts of BuddyPress. BP ships with a rich interface for displaying user-specific content – custom profile fields, lists of user activity and groups, user settings, etc. But the best thing about BP member pages is that their infinitely extensible. In this session, we’ll explore how the BP_Component API provides a rich interface for plugin developers to add tabs to BP user profiles. And we’ll talk about strategies for WP plugin authors to leverage this API to build BuddyPress compatibility into their existing plugins. Get acquainted with the many dos and don’ts of BuddyPress Theme Development from the very person who wrote the book on BuddyPress theme development. This will be a technical walkthrough of the creation of a BuddyPress-focused theme, highlighting all of the different options you have along the way. Following Tammie’s talk on how to design themes with BuddyPress in mind, JJJ takes us through a technical understanding of how the “theme compatibility” functionality of BuddyPress actually works. Specifically he demonstrates how to extend and override BuddyPress templates within your theme and how to build similar template compatibility into your plugins. Before you jump in and build that BuddyPress site, are you certain you have the right answers? Are you positive you’ve asked the right questions, even? If you’re using BuddyPress to build community, there are a ton of different questions you need to answer before you begin. Bowe will walk you through each of those questions, their common answers, and the many things he’s learned while building BuddyPress sites for fun and profit over the years. So many people mistake BuddyPress for a behemoth plugin that is only good for creating a full-stack social network on a site. While it is certainly good for that, it can do so much more! In this session, David will walk us through the many “non-traditional” ways in which a site can use BuddyPress to perfectly compliment their services, without adding a ton of weight or things they don’t actually need. If you’re not sure how to best put BuddyPress to work for your site (or a client’s site), this presentation is a must-watch. Now that you’ve got a good direction for all the different ways BuddyPress can be used, Michael will walk you through the configuration of a real, working BuddyPress site. We’ll look at the components used along with why and how they were used for that purpose. WordPress, BuddyPress, bbPress, Director of Web Engineering at 10up, formerly of Automattic. If you know what BuddyPress is, then you probably already know who JJJ is.